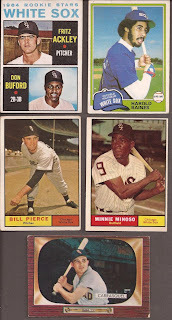 Before I get to the cards, give me a paragraph or two to set up this post. In my house of 4, comedy is a big thing. There is always laughter of some sort, or at least the desire for that. We all have fun playfully ripping into each other, or trying to get that quick wit line in a conversation. Movies/TV/video are also a big part in entertainment and humor. Like many of you reader (not plural....not a typo), great quotes get thrown around from time to time purely for breaking up the other person. And text message movie quote tangents are a pretty regular use of our unlimited messaging plan. A quite popular (among all the others) YouTube video that gets a lot of use in my house is Mafia Babies, a Brock's Dub remix of the talking babies meme. Out of the blue lines are thrown out.....just cuz. But in regard to this post, I would like to reference the disclaimer at the start of Mafia Babies: "..all the curse words have been replaced with baby friendly substitutes. Enjoy." Alright - let's take a look at the package I received a couple days ago from Troll at Collective Troll. 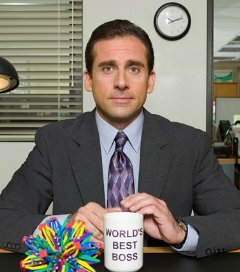 I work from home 4 days a week, and my wife is a speech pathologist in a school, this week being her spring break. So my fluffing day has been rough, but a visit from the postal carrier brings gifts. 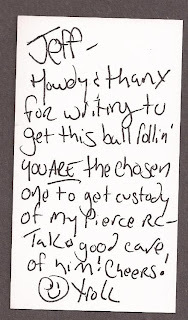 I hustle my ascot out to the mailbox to find an envelope with "Troll" return address on it. FLUFFING SWEET! As I pull it out, I am shocked at the size of his package. 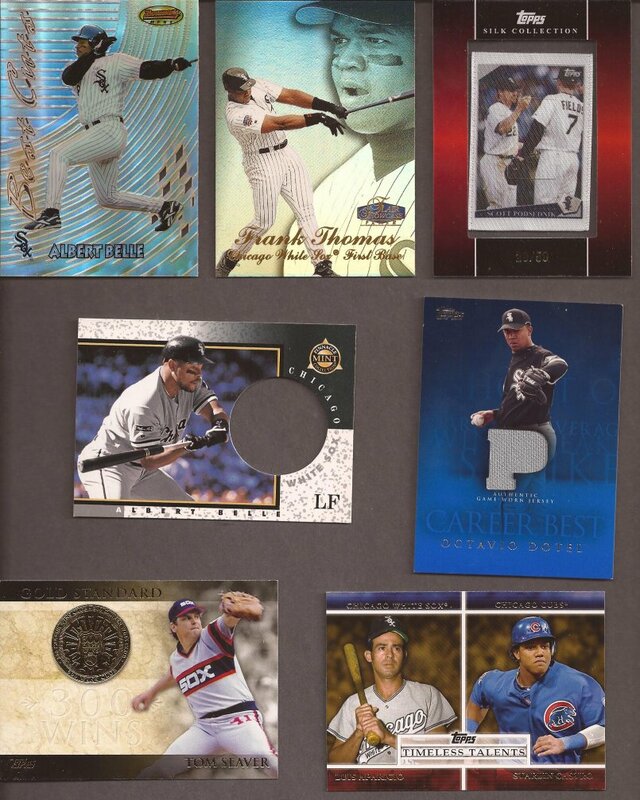 I sent Troll a bunch of set fillers and a Longoria relic from my trade bait he requested. This return envelope seems too fluffing large. Either he's too generous, or he was shaft-faced drunk when he mailed it. Still, let's see what we have. So I walk in to the bedroom and show my wife my latest postal prize. I comment to her that the sender is a roller derby announcer - how fluffing cool is that. We get a little laugh (see first paragraph). I open the package to a cool roller derby program that I show my wife. "See? So damp cool!" I say. As I walk back to my "office", I start reading the enclosed note from Sir Troll. "No fluffing way. No fluffing way." I mumble over and over. My wife inquires of what I am talking about. Dramatic pause in the post here - let's look at the non-related no-fluffing-way items in the package. And we start with A&G minis. 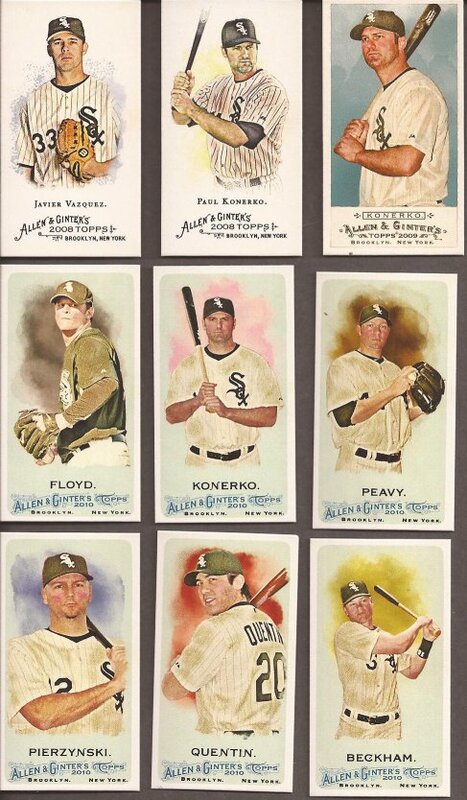 A nice 9 pack of White Sox minis. 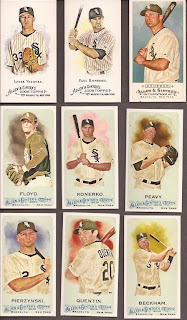 I believe I have a grand total of 0 of them, so let's call this 9 new White Sox in my card collection. 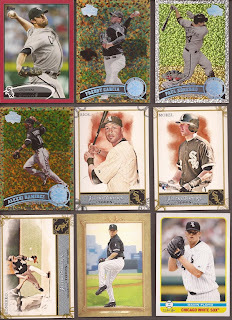 We move to a nice group of more recent White Sox cards. Any Aparicio is a win for me. I believe he will be the next project after my Billy Pierce collection is complete. 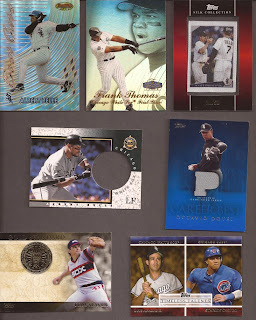 Couple Albert Belles, a nice Thomas Flair Showcase, a silk Podzilla (first silk I have in my collection and man, they're cool) and a Dotel relic. For those that like a good mystery, you missed a foreshadowing moment. Stephen King would be proud. Or not. Let's go back farther in the South Side player history on the next scan. Now you see my fluffing dilemma?! Troll - you have got to be fluffing shafting me! But that was no fluffing slip of the pen and here's the proof. I spent the rest of the day (and still even now) in utter amazement. 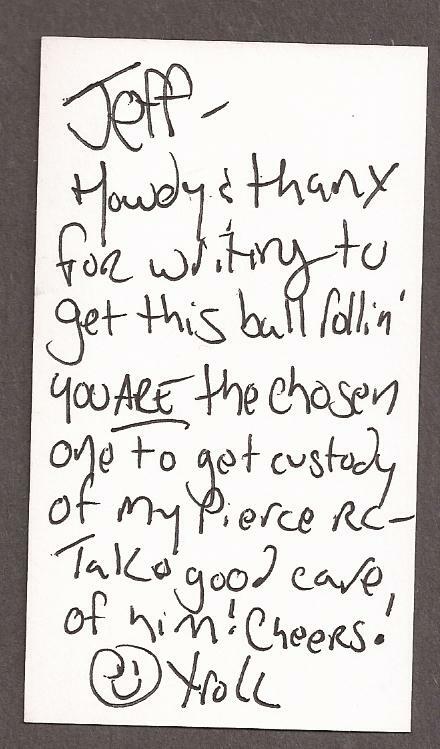 BTW, after I read Troll's note, my wife asks "Is that good?" Been living under a mother-fluffing rock, woman???? So that is trade #3 in the books, and a holy shaft trade for sure. I have let Troll know that he has a place to sleep if he is ever in my neck of the woods, and I have reversed a certain surgery I had so we can have another child only to name him Troll. Or her. Enjoy the name, kiddo. I love it!!! You get points for saying "fluffing" more times in this post than I have EVER seen that word... 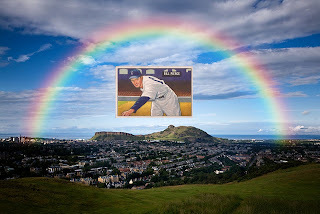 I LOVE the scan of the Pierce card! Cheers and thanks for trading! I think I've decided I don't like reading your blog. 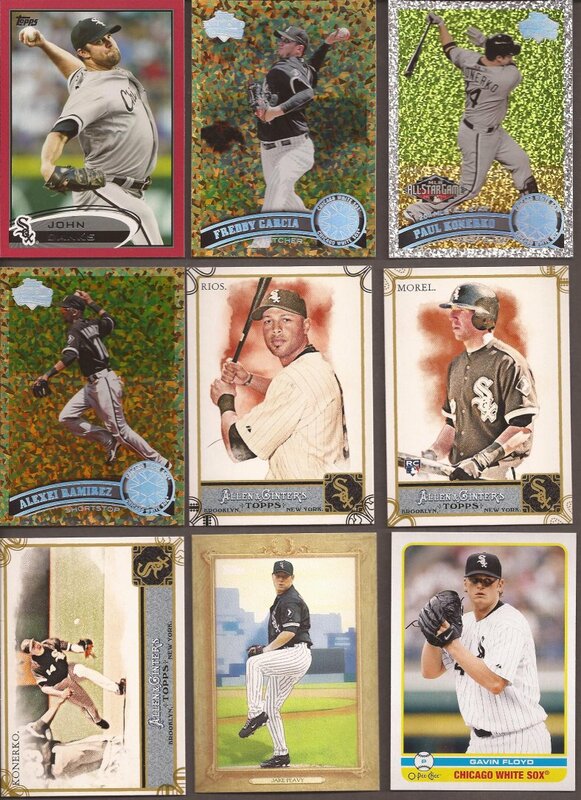 Too many awesome Sox cards that I want. Nice trade.